A Guide to Buying, Arranging and Caring for Long Lasting Peonies! Hold onto your horses baby, it’s Peony Season! It’s always such a thrill to get your hands on these gorgeous blooms, with their delicate petals, pretty colours and sweet fragrance, there really isn’t anything else like them. It seems most people agree, with about half of our customers listing them as their favourite flowers! Alas, they’re not here for long. So when they are, you want to ensure you get the most out of them. 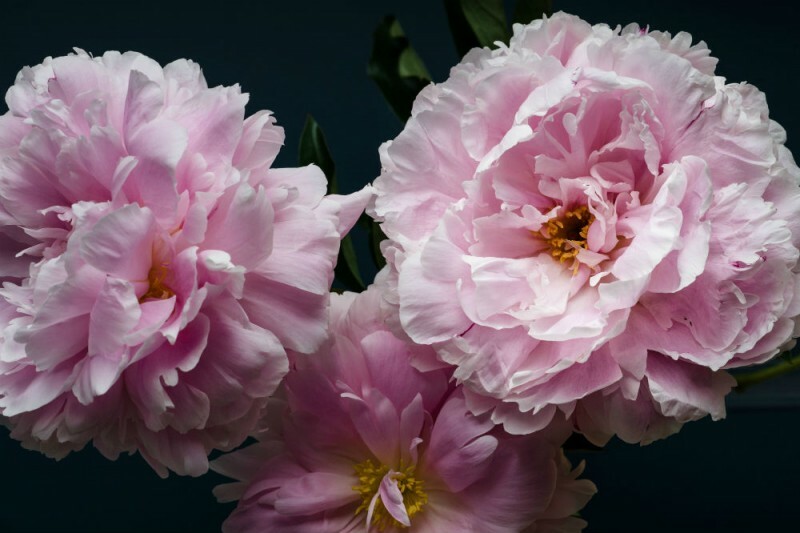 So peony lovers, read on for our essential guide, the 411 if you will, on all things Peony! When can you get Peonies in Australia? If you’ve recently discovered this fabulous bloom (thanks Instagram!) then you may not be aware that the Australian grown season is short and only lasts from the first week in November to mid-December. Once the local season is over, imported blooms will be available until around April or May, but you’ll notice that the price will rocket and the vase life will be less. If you’re considering Peonies for a wedding, it is generally a good idea to have a backup flower, a David Austen rose is a lovely substitute with a season which lasts until late autumn. At a pinch, carnations also have a stunning multi-layered (if less dainty) look, sometimes in quite similar colours. What varieties are on offer? Peonies are strong growing perennials that love a cold winter (probably the only part of a peony’s existence that we can’t get on board with! ), there are around 30 different species ranging in colours and sizes. 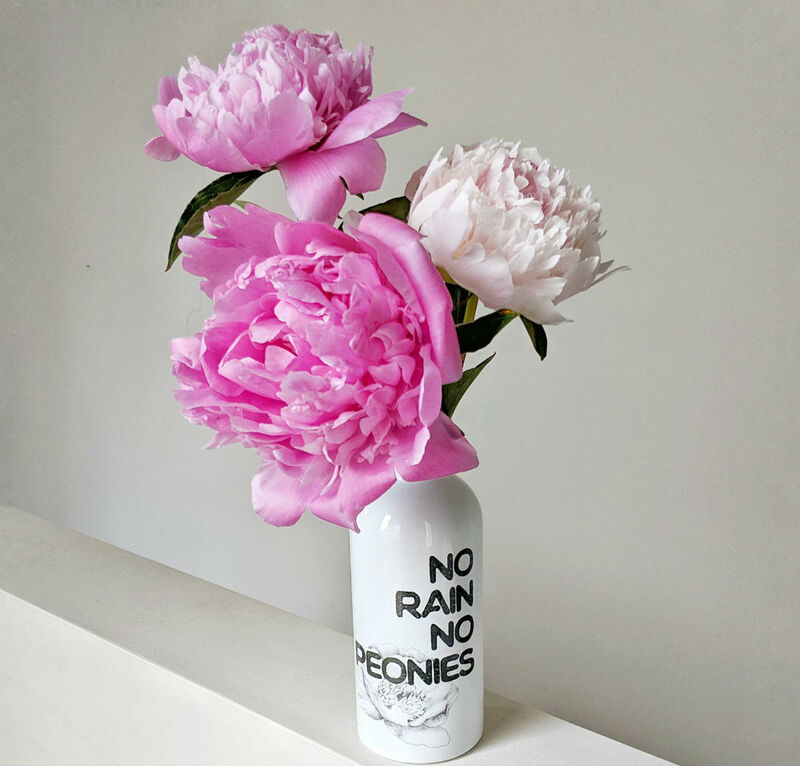 You may not know but not all peonies are suitable to pop in your vase so we’ve collated a mini list of our favourite vase friendly ones below. Sarah Bernhardt – Highly sought after for their large highly fragrant apple blossom pink blooms with rose blushes. Grab a bunch of these beauties when you can, you won’t be disappointed! Miss Melbourne – A large bowl shape with pale pink bloom with gorgeous ruffled petals. Coral Charm – An early blooming variety with an extraordinary colour. Deep coral pink buds unfurl into large semi-double flowers that fade to peach and lemon. Lady Alexander Duff – A lightly scented variety with elegant soft pink double blooms with pink outer petals and creamy inner petals – bi-colour heaven! Red Robin – Much like the Miss Melbourne the Red Robin bears an abundance of double ruffled petal blooms with a medium perfume but as the name suggests in a brilliant red. Just gorgeous! 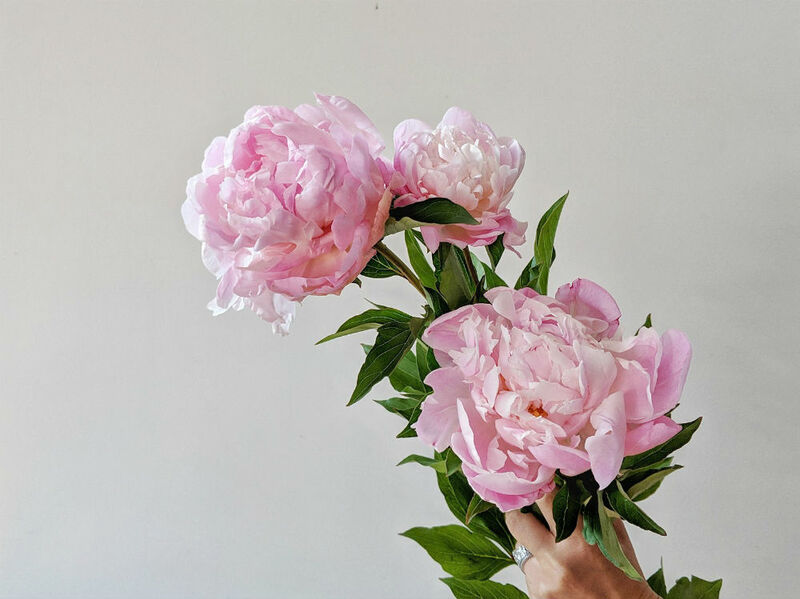 Whether you’re heading to the flower markets (if you’re in Sydney) or your local florist, it’s important that you look to buy the freshest blooms when Peonies are concerned. Look for plump buds with the petals unfurling that are clearly showing colour and be aware that flowers more than 50% open are more prone to handling damage. Peonies are very delicate so try to keep handling to a minimum and they will reward you with their best vase life and beauty. As with all cut flowers, you should check that the stems and leaves are clean, unblemished and don’t have a funky smell! 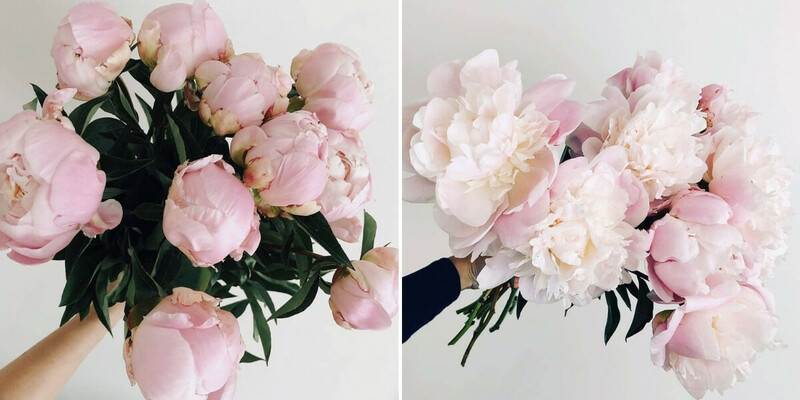 Otherwise, leave it to us, and get the best of these gorgeous blooms delivered right into your peony loving hands – so long as you’re within our Sydney and Melbourne delivery area! What do peonies smell like? Unfortunately, fragrance is one of those things that’s notoriously difficult to describe in words. And not all peonies smell the same! Different varieties are prized for their fragrance, which can range from warm, sweet and rosy, to cool, citrusy and fresh. Their scent is at their height early in their blooming process, when they are ripe for pollination – sending a strong signal to bees and other pollinators. Their fragrance can change dramatically from bud to late bloom, and can also be affected by the sun, heat and humidity. So clearly, their scent is as dynamic as the blooms themselves. To me (as people perceive their scent quite differently), peonies are the smell of luxuriantly warm summer days on the way. Rose-like, ultra clear and fresh, without being too sweet.You often hear the scent described as soft floral with a hint of green. Locally, the most commonly prized peonies for fragrance are the Sarah Bernhardts. In the Northern Hemisphere, varieties like Hermione are popular for their scent. Interestingly, despite numerous attempts to capture the magic of peonies in a fragrance, this alluring bloom seems to have alluded most scientists. Their volatile oils quickly dissipate and so many perfumes and home fragrances are synthetically produced. Consensus is that the lightness and subtlety of fresh peonies usually gives way to a “cheap” or “granny-like” scent in synthetic fragrances. In short – nothing QUITE beats the real thing. We love these beautiful blooms arranged in a vase on their own and they look fabulous in our very own small Joey vase. Group the stems in your hand and keep them short for a lovely fragrant coffee table arrangement. If you’re looking for a larger arrangement then we think they look great with Long Leaf Gum cascading over your vase and some Chocolate Sedge Grass left tall to create a little bit of drama! You often see peonies all styled at the same stem height, but we think they’re best arranged with some shorter stems recessed, and some that are a bit longer – allowing each bloom room to shine. Another tip is to make the most of that lush dark green peony foliage we all love so much. Not only is it long lasting, it’s also the perfect foliage to balance the softness of those big blouse-y blooms. Simply snip long stems just above a branching stem of greenery to get two or more pieces out of each peony stem. Watch this video to see what we mean. Peonies have a short vase life, around 5-7 days. But there are certain things you can do to ensure you get the very most out of them and encourage the continuing opening of the buds. Remove any lower leaves that may fall below the water line, to keep your peonies’ water as clean and unsullied as possible. Refresh the water every day or two. 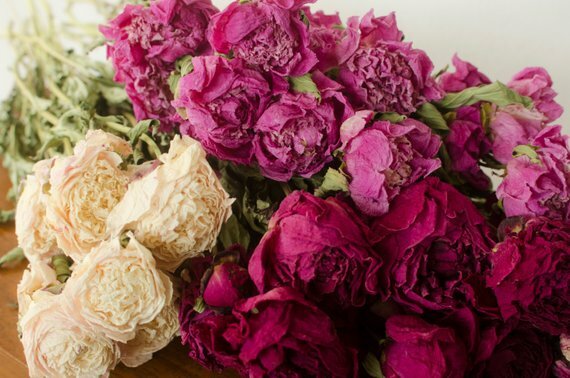 As your bloomed peonies wilt, remove them from your vase as it can speed up the wilting of the remaining blooms. TIP! Having problems with getting your peony buds to bloom? 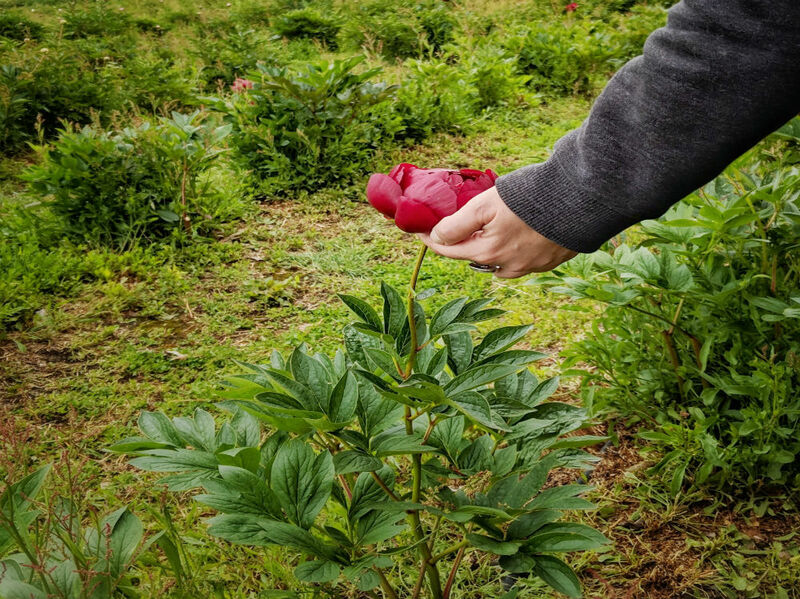 Each peony bud is topped with a sweet sticky nectar that attracts ants (peonies’ favoured pollinators), that can sometimes glue the petals together and stop the bud from blooming. To give them a helping hand to bloom, you can briefly dip the entire flower bud into warmish water to wash off the nectar. Here’s a cheat’s trick you’ll love, if you want to stretch out your peony joy even longer. You can bag closed buds in a large zip lock bag, sealing them up with paper towel to soak up excess moisture and pop them in the fridge for when you’re ready for them. When you take them out, give them a fresh cut and straight into water, and they should bloom in a couple of days! So if you have a bunch you don’t want to bloom all at once – keep a couple aside for next week! Consensus generally says “no” to dried peonies. But personally we love the look of the faded tissue paper petals in perfect peony formation. They won’t keep their colour quite like sturdier flowers (like strawflowers, statice or native flowers), but will dry delicately to pretty antique hues, held upright by fairly strong stems. To dry, simply wait until they are semi bloomed (not all the way, as they are more likely to fall apart), and pop in a vase with no water in a well ventilated spot. They’ll dry in a couple of weeks. Just be careful as dried peonies are exceptionally delicate, so keep them in a spot where they’re unlikely to get bumped. Don’t miss our on your very own bunch! Grab a 10, 20 or 30 stem peony delivery in peony delivery in Sydney and Melbourne before they’re gone for another year! Ria lives in Sydney and loves getting creative for Bloombox Co. She is dedicated to sourcing the most gorgeous local blooms the season has to offer.